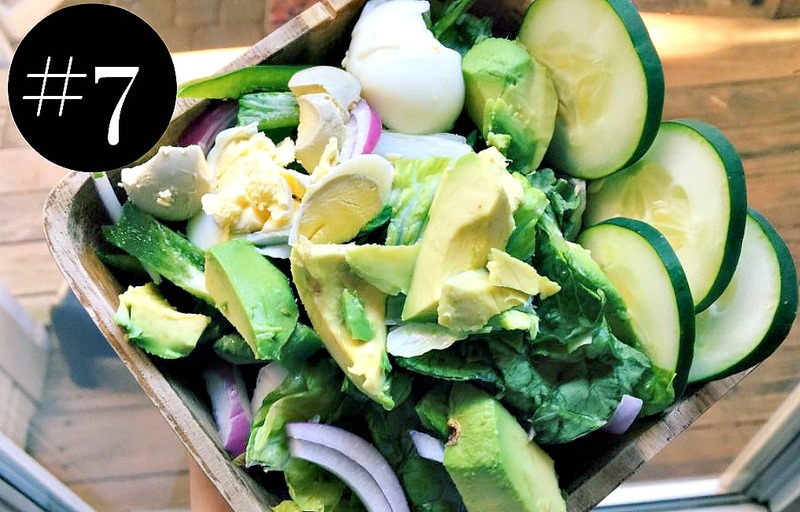 My 15 Favorite “At Home” Salad Fixes! It’s no secret that I love salads. You could put an entire slice of pizza on a bed of lettuce and it would make me happy. Maybe it’s because they are colorful and remind me of summer. 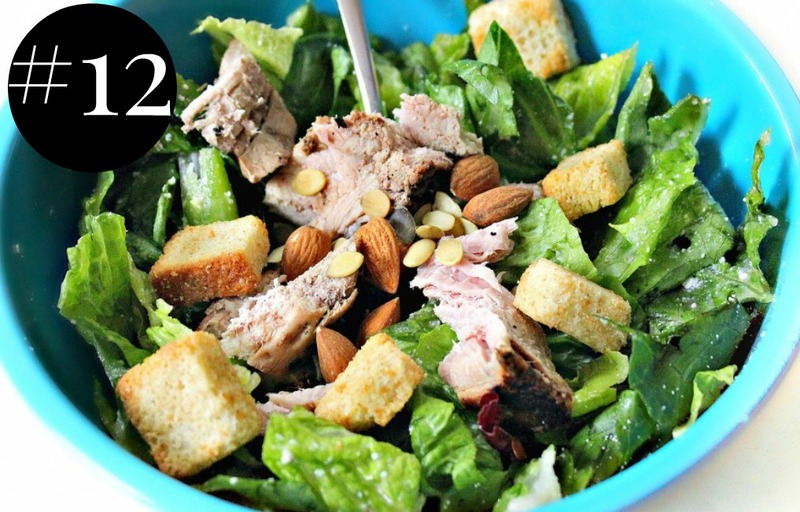 Today, I’m sharing my top 15 favorite “at-home” salad fixes! 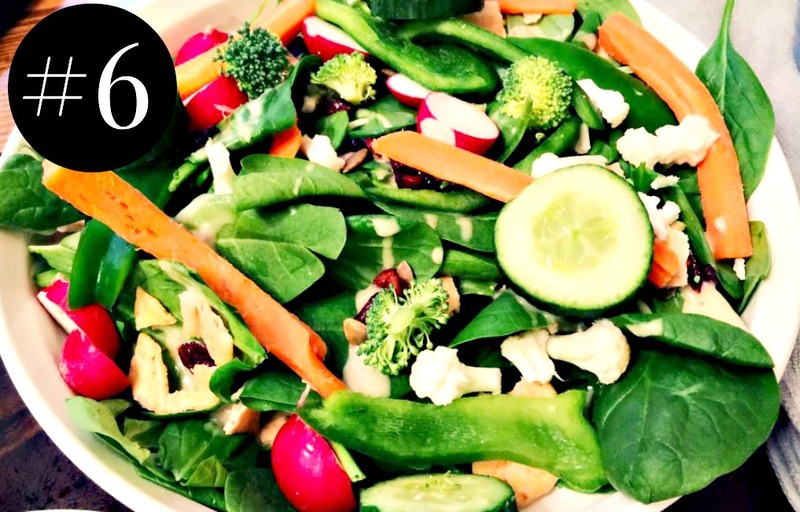 Salads are a great way to get your veggie fix, protein fix, and they keep you full longer. Salads save me from snacking and diving into the cereal box at night. They never get boring because there are so many ways to create them! Not to mention, they’re super inexpensive. You can buy a ton of ingredients and make salads all week long, or use dinner leftovers for toppings. 1. 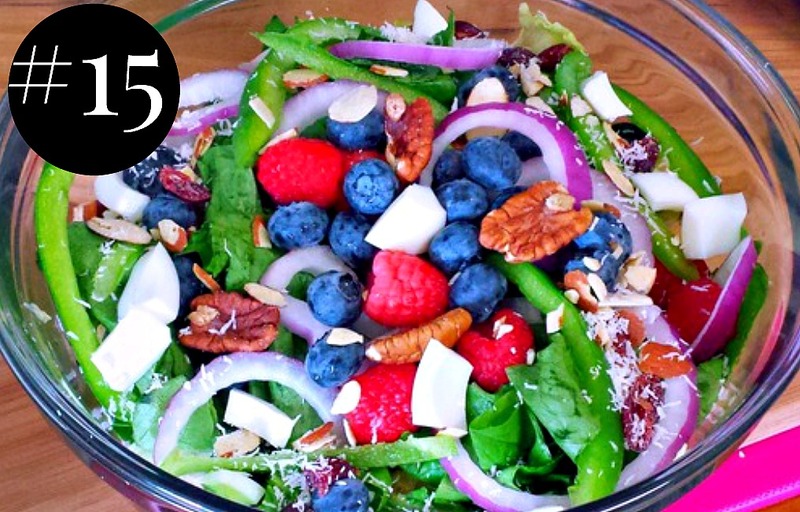 Create Five-Ingredient Salad. Go! 2. Do you eat salads all year round? 3. Sweet or Savory Salad? Depends on my mood but normally I love a good sweet salad! Any kind of fruit in a salad is usually a go to for me! As I look through your salads though I might have to try the turkey taco one, that sounds amazing! 1. Leftover roast vegetables, iceberg, kale, Brie cheese and homemade cranberry dressing. 2. Yes for lunch and dinner most days but my mum does a massive family roast every weekend and you won’t find a salad on the table. 3. Both to keep my sweet tooth at bay!! Thank you for all the great salad ideas! Thank you for the veggie ones too ??? 1.) I’m not sure I can pick just five ingredients! In general, I like romaine, various berries, avocado, chicken, and goat cheese. 2.) I eat a salad every day for lunch! I make them all ahead of time in mason jars. 3.) I like to mix sweet and savory together! I’ll have a mostly savory salad, but toss in some berries and candied walnuts. Sounds like you love salads as much as I do! Yours sound so good! Thank you for this!!!! I always get inspired by your combos. I made a ham/dried blueberry/rosemary cheese/kale/balsamic salad that was pretty great the other day. Savory with a hint of sweet. I agree with the combo of both 🙂 & dried blueberries are the best! 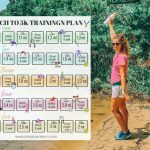 Such a great post, I loved all these ideas! I eat a lot of salads all year round, but probably more in the warmer months. I like to have a sweet and savory combination. 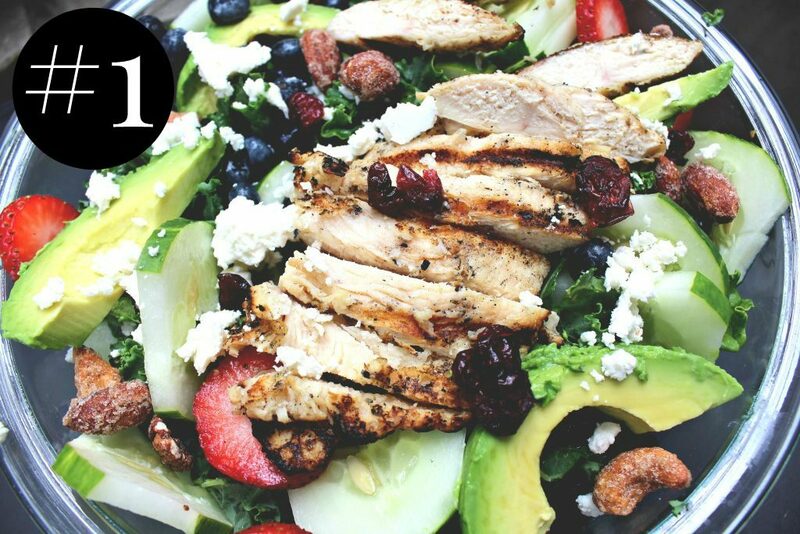 One of my faves is mixed greens, blueberries, avocado, feta cheese, almonds and an almond butter dressing. I base it on a recipe from Pinch of Yum. I love the combo too! That sounds like a really good salad 🙂 Pinch of Yum is great! :) I went on a press trip with her and her husband and they are WONDERFUL people. 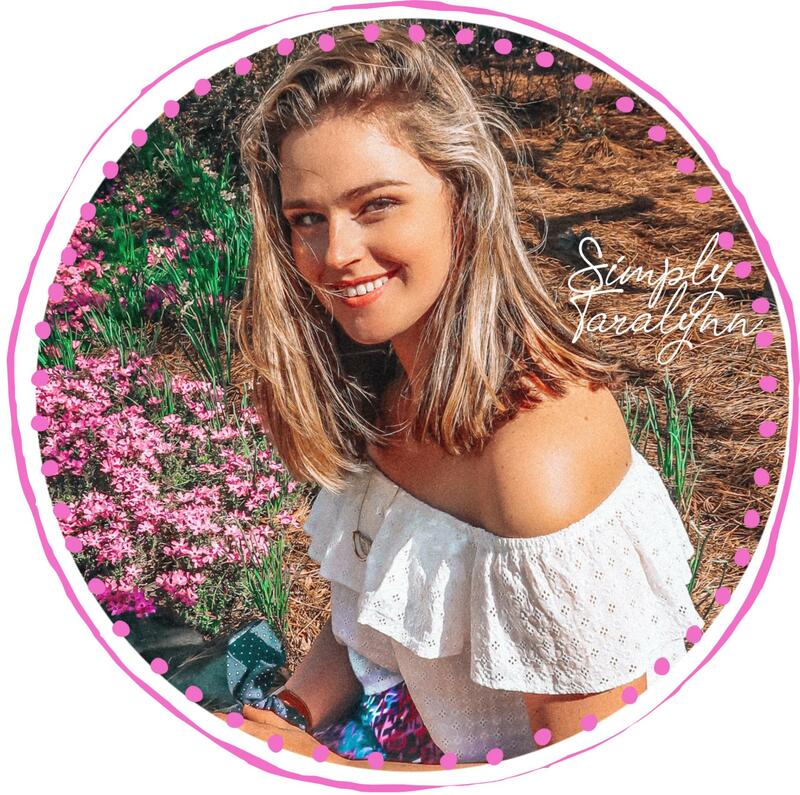 Great blog and recipes as well. Mmm yes please, going to try a few of these! Yum! I am definitely going to use this post for some salad inspiration! I always make one big salad every sunday that I eat for lunch every day. I’m in med school so this is an effective way for me to eat healthy every day! My salad includes: Kale (lasts longer than spinach), chopped fresh brussel sprouts, broccoli, granny smith apple, avocado, cucumber and then I’ll add a protein like tempeh that I marinate in soy sauce and maple syrup. Sometimes I make roasted sweet potatoes and mix those in too! Your salads sound amazing. The maple syrup & soy sauce combo? genius. Lol I love those ones too!!! 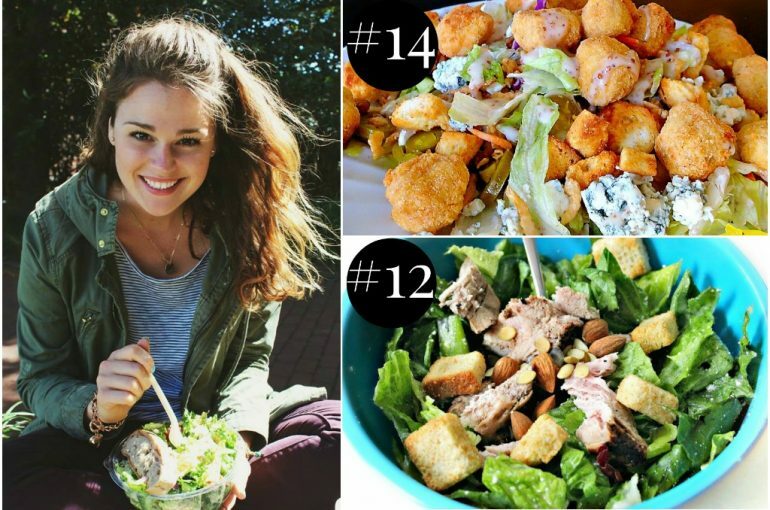 xo xo & you make some pretty mean salads on your blog too!! 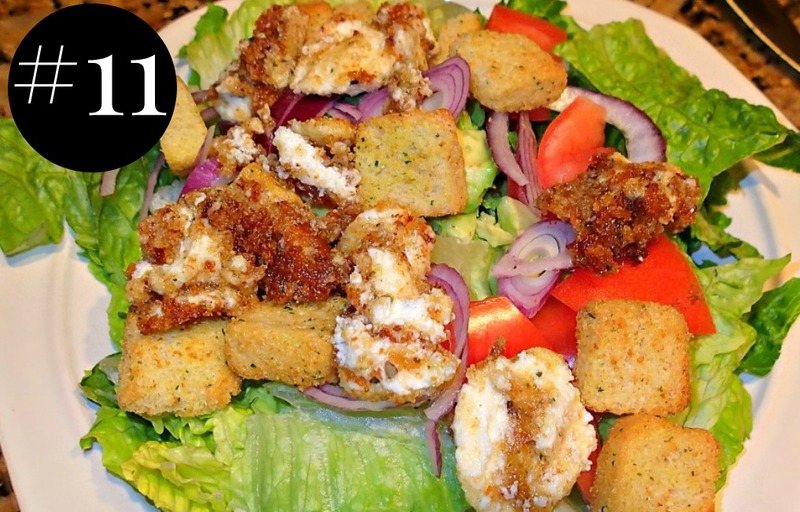 One of my favorites to make at home is a pizza salad! -Pesto Vinaigrette or a little Marinara! 2. 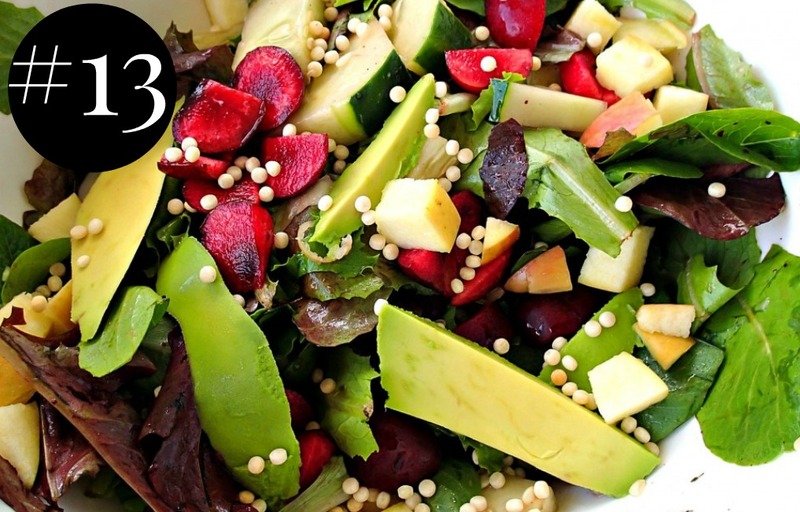 Do you eat salads all year round – yes! I love how long you can make a huge tupperware of meat, rice, cheese, veggies, etc. last throughout the week when you make salads. 3. Sweet or Savory Salad- Definitely savory!! I definitely eat salads all year round. Usually for lunch but sometimes for dinner! I get tired of old ideas so thank you for so many great new combinations! My favorite dinner salads are a turkey burger over a southwest salad. For lunch I love anything with arugula, or some simple classics like Cobbs and Greek! Today I had arugula, pecans, goat cheese, red onion, salmon and scallops with balsamic and EVOO. Delicious! Thanks for sharing new ideas! You’re welcome! I love adding black bean burgers on southwest salads! You should try the spicy black bean burger from Morning star on top of one. It’s so good, even my boyfriend LOVES it! The salad you had today sounds fantastic. 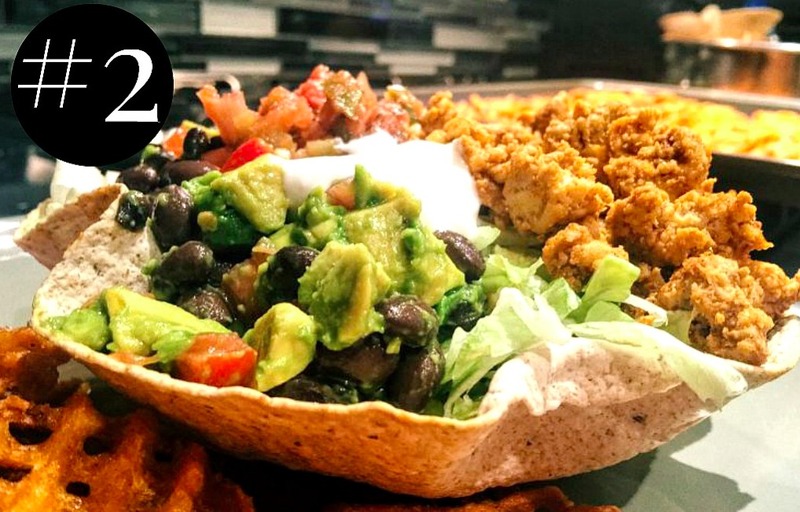 Oh my goodness that Ground Turkey Taco salad looks AMAZING!!! My favorite salad is one from a local restaruant here called “ZaZa’s” and it’s the Asian Ginger Chicken Salad! It’s delicious!! I agree with you though with being able to eat all kinds of salads with different toppings! So fun to change things up with them and mix in new ingredients! I definitely eat salads all year round. 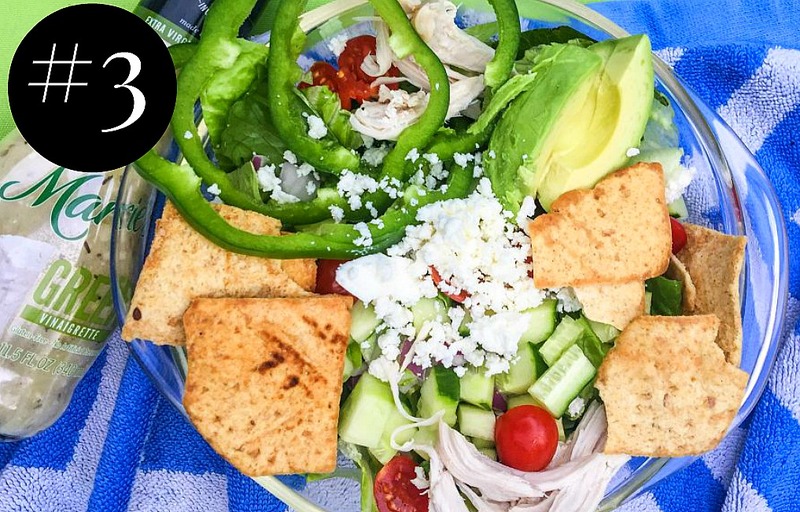 But, there’s nothing better than a fresh Summer salad! I am a savory salad kind of girl! 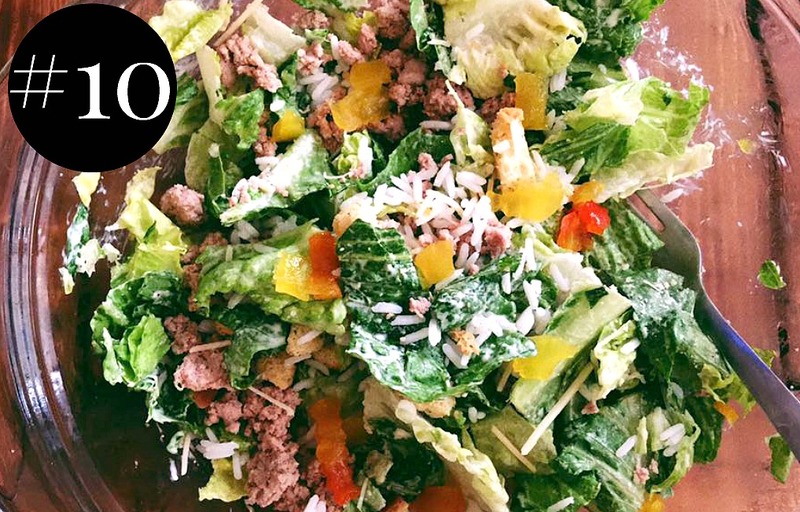 I love ground turkey (cold) in my salads! Salad is just so much better in the summer! Everything is so light and fresh. I’m so terrible at making my own salads, but I want to just whip them up like you do! Thanks for the wonderful ideas! I can’t wait to try these!!! Thanks for sharing! I will definitely be trying some of these out! I am wondering what kind of lettuce you usually buy? I always look for romaine but it usually does not look fresh or the spinach gets soggy. It all depends on what type of salad I’m going to make! I only buy lettuce when I’m going to eat it THAT day or the next. You can check the bags out, or go to a local fresh market. Oh my goodness thanks for sharing all of these! 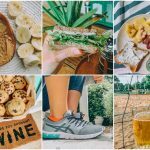 I love salads but never know how to make them fun and creative – I will definitely be re-creating some of your ideas to spice up my lunches!! Yum! I think you don’t like bleu cheese? Goat cheese would be just as good! 2. Salads are my go to all the time! 3. Definitely the combination of both! Me too! :) & that combo sounds awesome! Ooo…that pecan and sweet pepper salad sounds yummy! 1. 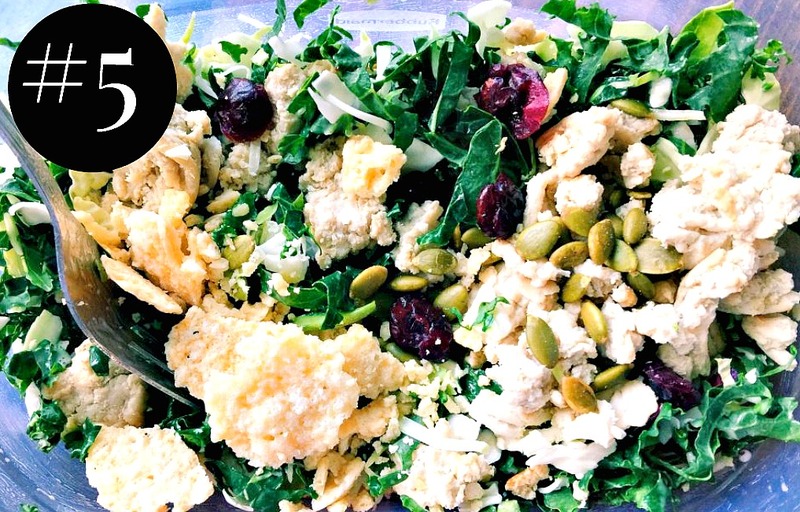 One of my all-time favorite go-to salads that I’ve been eating a lot lately…. Spring salad mix, cooked rice, black beans, salsa, and avocado. 2. I do eat salads year round, but definitely more in the warmer months. I go through phases of wanting salads and then not wanting them…but I’ve been on a salad kick recently! That salad sounds really good! Where is that green jacket from (first picture)? Arugula, strawberries, feta, almonds with a bit of olive oil and Traditional 18 year aged Balsamic (we order it from Creede Olive Oil Company in Colorado, their olive oils and balsamic’s are amazing!). So good! Ohh so much inspiration! Definitely have to bookmark this page. That sounds great! I’d even add a little balsamic to it! you better jump on the sweet train! Yes, I love them in the summer more with fresh garden tomatoes though. I live in a colder climate so they aren’t as good all year long. 1. Chickpeas, feta cheese, romaine, onion, and balsamic vinaigrette! So so good. 2.) I definitely eat salads all-year round! 3.) Savory salads, always. All of these salads look and sound FANTASTIC. 1. BBQ chicken, roasted corn off the cob, romaine, poppy seed dressing, sunflower seeds, avocado. Summer in a bowl! 2. I like to call myself a salad connoisseur. I eat salad every single day for lunch. Let me reiterate that….EVERY. SINGLE. DAY. Just like your post shows, it’s so versatile how could anyone ever get sick of it. You can change it up in so many ways!!!! 3. I prefer savory salads with a sweet add-in to them. My favorites are cranberries, poppy seed dressings, or catalina dressing. That in addition to any savory salad is a perfect combo. Your salad combo sounds amazing!!! Thank you for this! I love salads but get so bored eating the same kind. I’m also not very creative on my own with ingredients so having this list is wonderful to try something new! You’re welcome! 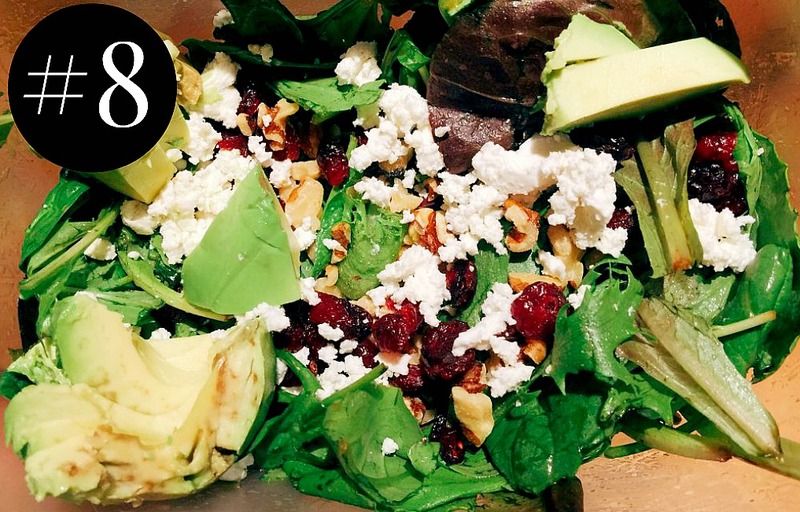 I like to go through my salad posts before heading to the grocery store for ideas! 1. My favorite salad is one I recreated from our local tea room. Mixed greens, grilled chicken, feta, diced apple, and pecans with a raspberry vinegrette. I also like adding dried Craisins to it for extra sweetness. 2. I eat salads all year round! During the spring/summer I eat them with grilled meats and fruits mixed in. In the fall/winter I love doing rotessouri chicken and roasted sweet potatoes in my salads or just making side salads with my meals to get my greens in. 3. Savory or sweet works for me – a little of both! But I think my favorite salads are taco salads! Yum! I love anything with pecans! Sweet salads are my favorites! Yum!!! Love a sweet salad with feta! What exactly makes Caprese salad a “CAPRESE salad”? Is it the specific cheese? It’s made of tomatoes, basil, mozzarella, and sometimes balsamic. 1. iceburg lettuce, carrots, cucumber, tomatoes and fat free ranch. simple and so good! and low cal too. 2. yah pretty much I do lol! 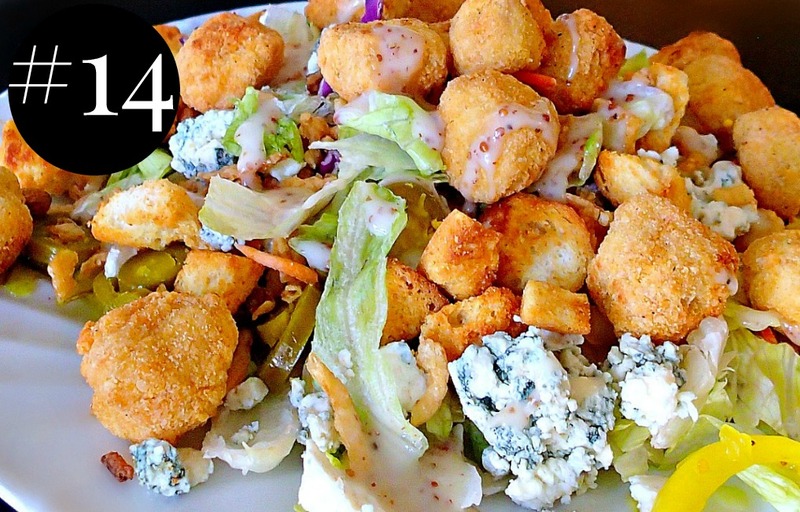 So much crunch in that salad. I can’t do ranch unless it’s from a restaurant lol I hate the bottled stuff. This is such a fun post idea – love it!! My go-to salad would have to be grilled chicken Cesar with red onions, edamame, Parmesan, and avocado. I love salad year round. In the winter I pair it with soup and over the summer I just eat it topped with bbq. I’ve actually never had a sweet salad. I’ve always been to nervous to try them, but some of your combos look so yummy I might have to finally make one. yes! caesar + red onions is one of my faves. 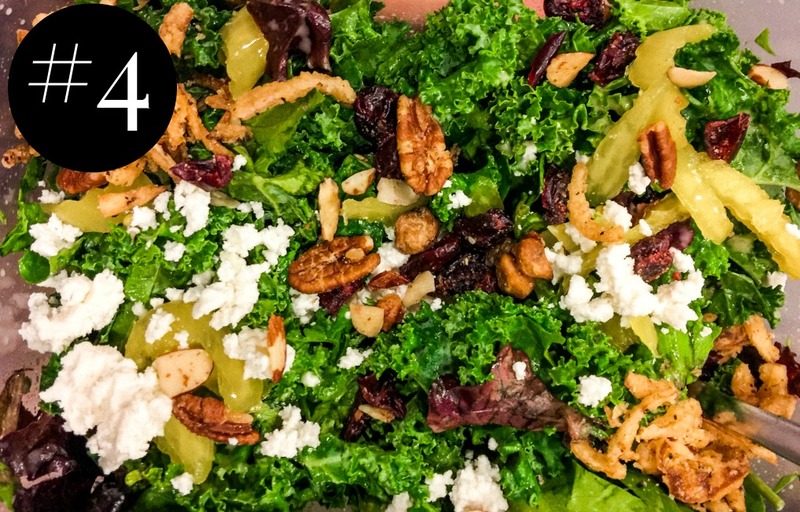 Oh, sweet salads are game changers. YUM!!!!!! That sounds so good. I love salads too and I could eat them forever and never get sick of them. I really like the way this post is laid out! Also, I can’t wait to try some of these! i loooove salads (which totally sounds lame when said outloud, ha). but really i do. 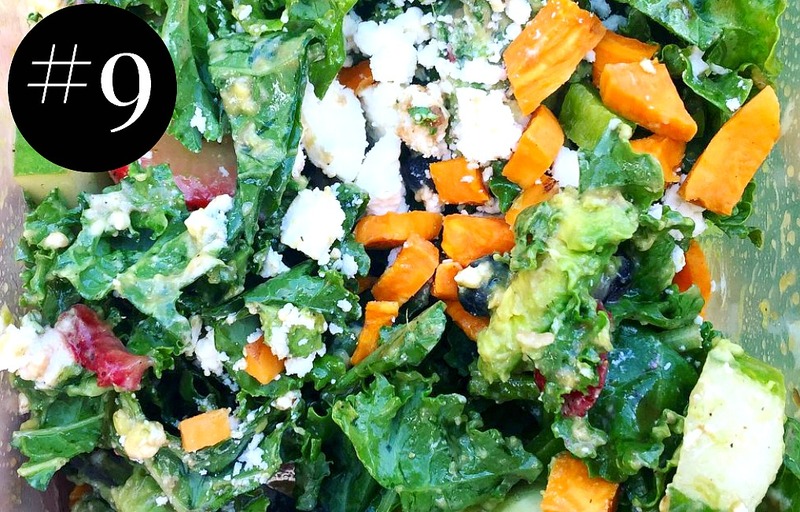 five ingredient salad: kale, avocado, butternut squash, macadamia nut, grilled chicken. perfect! YUM!!! that sounds like a crazy good combo. I’ll have to try that! I will probably add some goat cheese in there too! – Lettuce, tuna fish salad (canned tuna, light mayo, dill relish), sliced apples and avocado. Drizzle of light honey mustard dressing. – Lettuce, GF chicken nuggets, avocado, roasted green beans, light honey mustard dressing. That all sounds so tasty. Savoury salads FOR SURE! Chicken breast is essential – all year round! Yes girl 🙂 I agree! Lol you just gotta gradually convert him! My boyfriend isn’t a giant fan of salads either! 1. Turkey meatballs, ricotta cheese, iceberg lettuce, red onion, cucumber, little bit of marinara! The best savory salad ever!!! 2. I eat salads allll the time!! The are so easy because you can put anything on top of them! 3. I like sweet and savory!! Ps. you are amazing. Reading your blog is my favorite thing. Your salad combo sounds fantastic!! !